We modify all engines in a way that the combustion is improved. We do not simply increase turbo pressure by 30% and hope it will work out fine, but we meticulously test all adjustments for both safety and performance. It is very important to understand how the ecu works and what the exact factors, offsets and axis are in the map of a file. This way you can modify the ecu correctly. 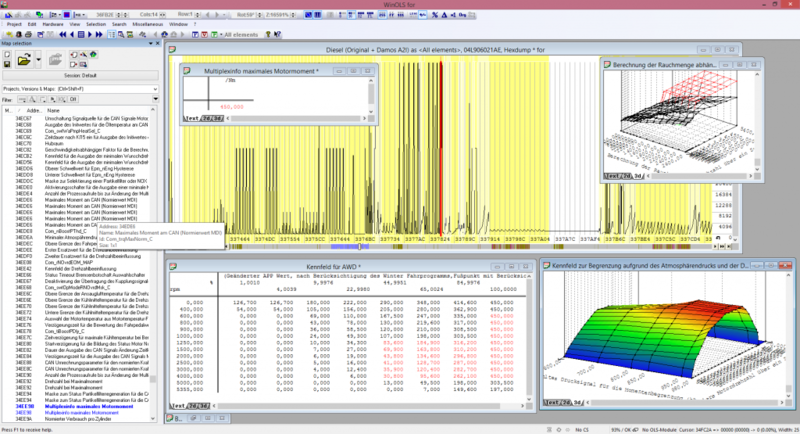 In order to know this data we need to compare your file with our damos A2L and Funktionsrahmen. For most ecus we have this data available. Feeling more power during a testdrive or measuring it on a dyno is no guarantee that the engine of your vehicle is optimally adjusted. In fact, in most cases, the changes are completely illogical according to the manufacturer, inefficient and harmful to your engine. Then we modify the request of torque and airload in the pedal maps. After that torque and airload limiters for component protection are increased. The airload turbo limiters are only increased minimally and only in the efficiency island of the turbo to prevent surge and choke. On the datalog we can see requested and actual given boost. We make sure these values match as much as possible to make sure software is balanced. In some cases we need to modify and extend turbo PID control and wastegate maps including axis to make sure the requested airload is supported in these maps. To keep the torquemonitoring system working correctly we also modify these maps in reference to our requested torque and airload. In case of a fuelrail system we add minimum pressure to the fuelrail for a slightly improved spray pattern. When air and fuel are set correctly we optimize ignition in our tuningfile. The modification of ignition is based on sort of fuel, petrol or gas, fuelquality, RON/MON/AKI values, outside conditions, the modified lambda AFR values and compressor ratio. With ignition it is important to prevent knock, detonation. So we retard the timing, in case of a higher compressorratio. But in many cases it is possible to even advance the ignition. When this happens the safety margin in degrees of crankshaft to prevent knock is too high for an optimum combustion. So if we advance then, the combustion will be more efficient. The downside of this is that it causes higher NOX values. The profit is better efficiency. When developping a tuningfile we can perfectly see in datalogs if ignition is optimal or not. When ecu is retarding the base ignition, this is a clear sign of too advanced ignition. But ofcourse the best way is to datalog the knock sensors on all cylinders. Temperature limiters on oil, fuel, coolant, intake air and exhaust gas temperature are in many cases not deleted in our tuning file for original parts, they are just slightly modified to prevent them from cutting power too early. The combination of all these small modifications gives you a high quality safe tuningfile for original parts, which gives great power and is very well balanced. Of course in many places, there are many more modifications we make in order to make a car run well and consistent. This is just a brief explanation of what we do to an engine. One overall comment we need to make is that this is just one strategy of tuning. There are different strategies possible. We tend to keep this specific strategy because it is closest to how the factory would do it. However there are some cases where we change strategy because too little information is available about the ecu, or in case a different strategy just gives better results. removal of Cat control function, second lambda sensor off. The engine of your vehicle will be modified in such a way that the combustion will be greatly improved. We do not just increase the turbo or injection by a 10 percent and hope it will be alright. In order to know this data we need to compare your file to our damos A2L and Funktionsrahmen. Feeling more power during a test-drive or measuring it on a dyno is no guarantee that the engine of your model is optimally adjusted. First we modify the request of fuel or torque in the pedal maps. Then the torque limiters for component protection including the single value torque limits. 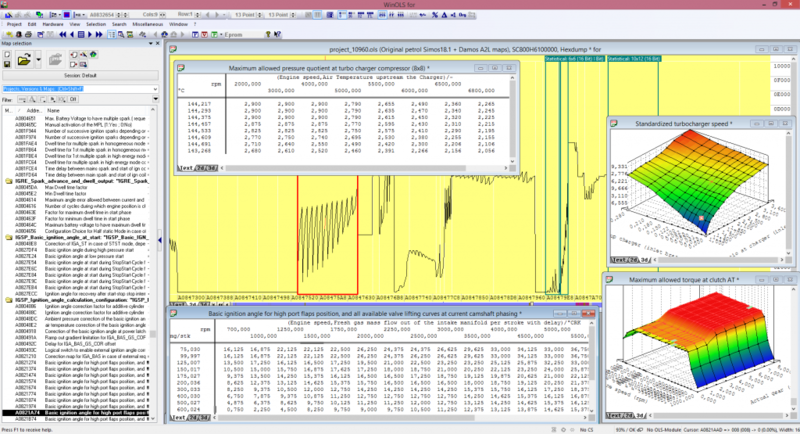 When datalogging and during a dynorun we can perfectly see if we have put all limiters at correct settings. We check if smoke limiter is set high enough for requested torque if not, we modify it, but not too much, to prevent it from smoking. We add minimum pressure to the fuelrail for a slightly improved spray pattern. In some cases we need to extend the NM conversion maps including axis to allow enough Newtonmeters to be converted into a realistic milligrams of fuel injection. In some cases we change the values in the injector map too, but we try to keep this to a minimum. In order to optimize combustion we modify the start of injection. The downside of this is that it causes higher NOX values. The profit is better efficiency. We modify turbo pressure to make sure the mixture stays correct. 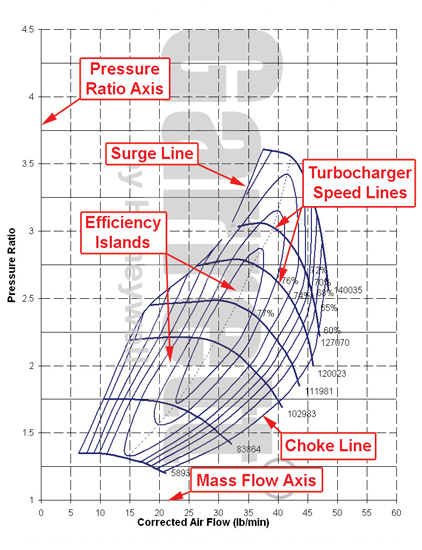 Turbo pressure is only increased minimally and only in the efficiency island of the turbo the prevent surge and choke. In some cases we need to extend the axis and allow higher values in the turbo maps to allow more boost at a higher specific injection quantity. 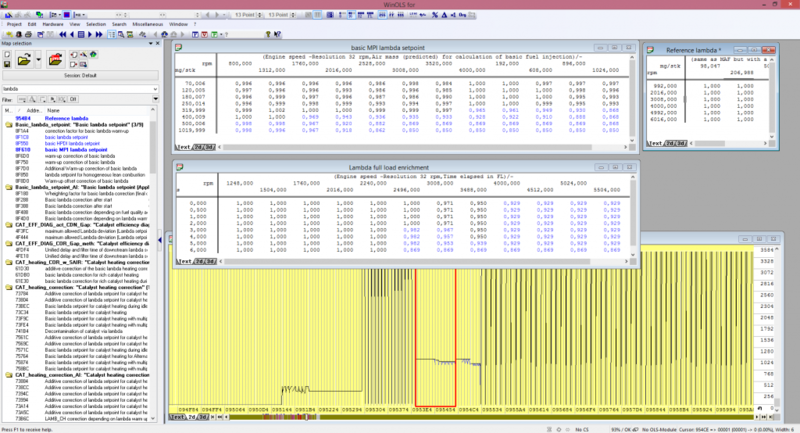 Then we perform datalogging and check what lambda and fueltrims are doing. We use this data to correct the lambda maps. Temperature limiters on oil, fuel, coolant, intake air and exhaust gas temperature are in many cases not deleted in our tuningfile for original parts, they are just slightly modified to prevent them for cutting power too early. Ofcourse there are many more modifications we make in order to make a car run well and consistent. This is just a brief explanation of what we do to an engine. Do you want us to make a great tuningfile? Please register, buy credits and upload your readout file. We love the Nürburgring Nordschleife. The atmosphere, the race track. 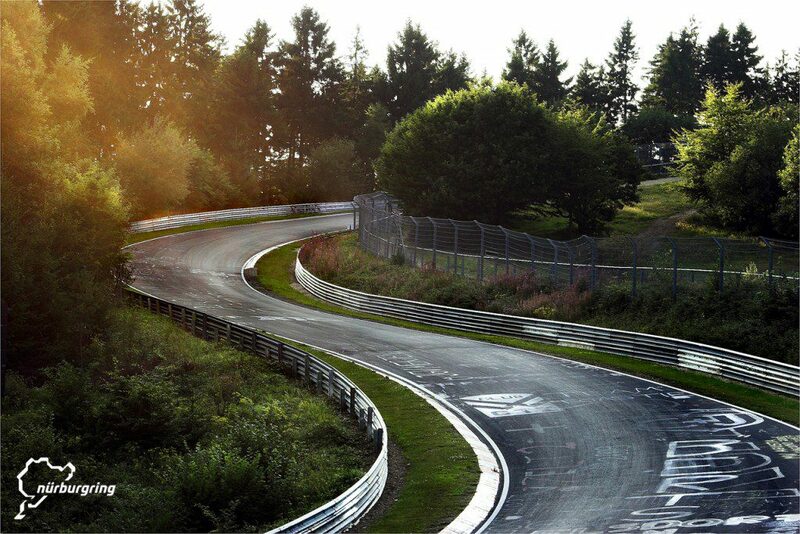 Many of our chip tuning files are tested on this famous German race track. ECUfiles tuningfiles are Nürburgring approved!